Arrival Leh Kushok Bakula Airport (3500m / 11565 ft). Upon arrival welcome and meet by our representative and transfer to Hotel/Guest for check in wherein welcome tea and coffee will be served. Complete half day rest at hotel for acclimatization as it is important at the height of Ladakh. Lunch will be served at 2:00 PM. Afternoon around 3:30 PM sightseeing to Shanti stupa and 17th century Leh palace. Overnight at Leh in Hotel/Guest house. Full day sightseeing of Indus valley monasteries. (47 Km - Round 94 km - 5/6hrs). Today after breakfast at 8am full day sightseeing of Indus valley, 16th century Shey palace – King Chapel, 14th Thiksay monastery and 17th century Hemis monastery. Sightseeing start with 17th century Hemis monastery 47km from on the way stop to take the photos picturesque view of Shey palace and Thiksay monastery. After Hemis monastery drive 14th century Thiksay on the same way back. Visit Thiksay monastery and Lunch at Thiksay monastery restaurant. After Thiksay monastery drive back to Leh on the way visit 3 Idiot Rancho School, 16th century Shey palace and Sindhu Ghat. Evening at leisure to explore the city on your own. Overnight at Leh in Hotel. Leh–Nubra valleys via Khardong-La pass 5,602m (140 km – 4/5 hrs). Today after breakfast at 8:00 AM leave to Nubra Valley, popularly known as the valley of oasis among the tourist. The road journey from Leh to Nubra Valley passes over Khardong-La (One of the highest motorable road in the world at 5,602 Mtrs / 18,390 Ft) around 39 km from Leh. From the pass panoramic view snow peaks range of Zanskar valley. After 1:00 hrs drive from Khardong-La pass there is Kardung village, the first village on the way to Nubra valley. Stop at Kardung village for hot lunch in restaurant and short hike after long hrs drive. Reaching Deskit village around 3:00 PM or 4:00 PM, Deskit now main town of Nubra valley. Visit 14th century Deskit monastery and 107feet Maitreya Buddha. After sightseeing of Deskit monastery drive to Hunder sand-dune 6kms from Deskit monastery. Explore the scenic beauty of Hunder sand-dune and double hump camel riding and today Nubra valley tour end here. Overnight at Hunder in Deluxe camp/Hotel. Nubra valley – Leh by same route. (120 km – 4/5 hrs). Today after breakfast at 8:00 AM check out from the Hotel/Camp and drive to back to Leh on same route via Kardung la pass. Stop at Kardung village for hot lunch in restaurant. Reaching Leh around 3:00 PM or 4:00 PM. Evening free to explore Leh market. Overnight at Leh in Hotel. 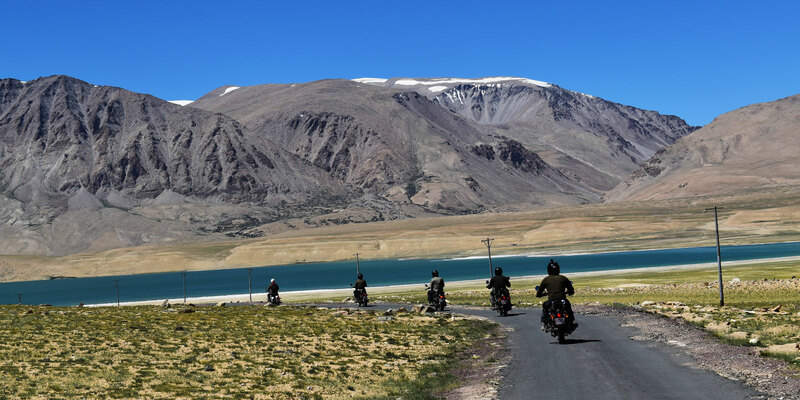 Leh – Tsomoriri Lake (220 km – 6/7 hrs). Today after breakfast at 7:00 AM leave to Tsomoriri Lake drive long the Indus River passing through many charming villages on the bank Indus River. Reaching Chumathang village round 12:30 PM or 1:00 PM visit Chumathang hot-spring and short hike in the village after long drive. Panic pack lunch at Chumathang, After lunch drive to Tsomoriri Lake passing through small pass Namsang-La pass and small Lake name Tsochungkaru Lake. Reaching Tsomoriri Lake around 3:00 or 4:00 PM. Evening hike around the Lake and enjoy the panoramic of view lake and surrounding landscape and visit Korzok monastery. Tsomoriri Lake is located at 14,000 ft. is breeding ground for numerous high altitude species of birds, like the bar headed goose, crested grebe, the Brahmini duck (ruddy sheldrake) and the brown-headed gull. On the bank of Lake small village of nomad name Korzok, Korzok village have small monastery affiliated Druk Kargyu sect of Tibetan Buddhism. Overnight at Leh in Hotel or Deluxe camp. Tsomoriri Lake to Leh via Tsokar Lake (260 Km / 3 hrs). Today after breakfast at 7:00 AM leave to visit nomad camp 2 km behind Korzok village. The nomadic people are most outstanding feature of this area. They can be seen moving from one place to other grazing herds of goats, sheep and yaks. Nomad passes their everyday life with their cattle. After visiting nomad camp drive to Tsokar Lake on the way visit Puga hot-spring and chance to see herd of wild donkey, blue sheep and migratory birds at Tsokar Lake. Panic pack lunch at Tsokar Lake. Post lunch drive to Leh passing through Tanglang-La pass the second highest motorable pass in the Ladakh, at Tanglang-La pass panoramic view Himalayan range. 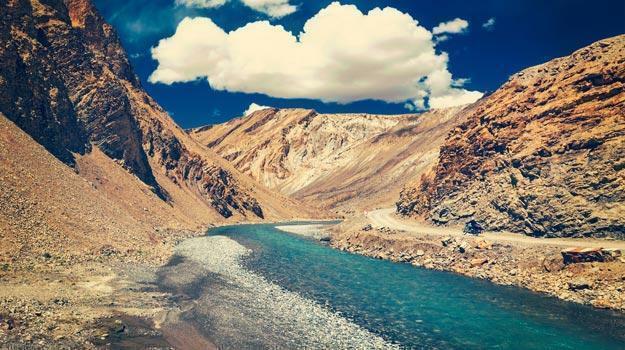 From Tanglang-la pass to Leh drive through several charming villages located in the narrow gorge of mountains. Reaching Leh around 6:00 PM or 7:00 PM. Overnight at Leh in Hotel / Guest house. Leh - Pangong Lake (14,000 Ft) – Leh. (140 KM one way - round 280 km - 10/11Hrs). After an early breakfast 7am leave to Pangong Lake passing through Changla pass 5486 mtrs the world third highest motorable road in the world. The long easy ascent takes you to Changla pass through its winding roads passing through Sakti Village. Stop at the Changla Pass for a quick photograph session and drive down to the village of Tangtse, where you can relax for a cup of tea. Leaving Tangtse for Pangong you pass through few small villages of Changthang and finally you can have a sudden view of the Pangong Lake situated at 14,000 feet (4,267 m). One rarely feels so close to nature and environment and the scenery is unforgettable. After spending some time at Pangong Lake around 1:30 PM drive back to Leh and you will reach Leh at 5:30 or 6:30 PM. Overnight at Leh in Hotel. Flight Leh – Delhi. After early morning breakfast transfer to airport and fly back to Delhi with sweet memories of Ladakh. Tour and service ends. Tour and service end. Note :- Availability of rooms in above said hotels is subject to advance reservation.